Hyde's 1st team were in action again on Tuesday night this time against Rochdale. 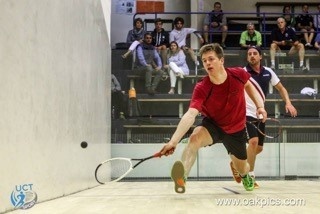 Hyde were under strength with the loss of their usual numbers 1 and 2, George Parker and Julian Tomlinson, who were both away playing for teams in the National Premier Squash League. However, a battling performance from all the team saw them to nail biting 3-2 win in one of the most entertaining matches of the season so far. As usual for Hyde Steve White was on first, looking for his win in four games, and knowing that a winning start would be crucial for either team. He was up against Steve Cummings who he had lost two in the previous two meetings. In a close match that both players had control of at various points, Steve White finished the strongest and took the fifth set a comfortable 11-4 to win 3-2 and give Hyde the perfect start. On next was Carlton Oldham, a late call up to the side but the promising Hyde junior didn't let the side down. Playing the experienced Andrew Jagger, who was yet to lose against Hyde, Carlton showed why he is regarded as one of the best juniors in the area keeping his cool and his concentration to win another 5 setter for Hyde 3-2 so giving Hyde a 2-0 advantage. On the other court at the same time, Jach Alcock was taking on Lewis Doughty. Another close game but in truth Lewis always looked to have the edge over Jack. Some tight intelligent squash from Jack saw him take the second set but it wasn't quite enough as Lewis ground out a 3-1 win for Rochdale to get them back in to the match at 2-1. On court next were the final two and deciding matches, Steve Gregory, for Hyde, was playing Chris Morrison and Steve was in prime form playing some of his best squash to take a 2-0 lead. At the same time Josh Taylor was playing Guhan Senthilkumar. Josh struggled to find his timing and length at the start of the match and quickly found self 2-0 down but by the end of the second set looked like he was starting to find some form which he took on in to the next sets winning the next two to make it 2-2. Meanwhile Steve Gregory started to struggle with a muscle pull in his leg, noticeably slowing him down, which Chris took full advantage of to come back and win 3-2, meaning the match score was 2-2 with Josh and Guhan playing out the deciding match and at 2 games all and 7-7 in the decider it could have gone either way. Josh's determination and self control in shot selection saw him home though to complete a remarkable comeback and win 3-2 and therefore give the win to Hyde. An excellent night's entertainment with five quality games, played in the right spirits was enjoyed by all who came up to watch. Hyde's battling win sees them remain 5th in the league with 10 wins.